In the past on Style Crone I’ve written about the importance of health and how it’s my number one priority. I structure and weave my time around physical, emotional and mental self-care. However, no matter how much energy I put into creating a healthy lifestyle for myself, some things are beyond my control. I received the diagnosis of osteoporosis many years ago, and have tried several options to improve my bone density. However, my most recent numbers were disturbing and I know that I must do something more proactive to prevent fractures in the future. I’m researching and consulting with experts about the best plan of action at this point. The last thing I want to do is deal with chronic pain secondary to a fracture. A few months ago, during my annual eye exam, I mentioned to my provider that my eyesight had declined since last year. I have the beginning of cataracts, but she became concerned about the loss of sight in my right eye as compared to my last exam. I was diagnosed with epiretinal membranes in both eyes, which is a thin sheet of fibrous tissue that can form on the macula (the sharp focusing area at the back of the eye). Apparently this is due to aging, could not have been prevented, and there is no treatment necessary at this time. Surgery is available if my eyesight deteriorates significantly, but for now, there’s no plan of action except follow-up every six months. Both conditions are not externally apparent, but I know they exist. They remind me that most people deal with some form of health problem that comes forward as aging progresses. It took time to adjust to the concern about my eyesight. Today it sits in the background and doesn’t cause anxiety or fear. All of this could change, of course, at the drop of a hat. I’m well aware of how quickly life turns on a dime. But for now, the silent stalkers of my health are quiet and lurk at a distance, with little effect on my life. However, do I really have to stop wearing heels for my safety? Am I in denial about the changes and choices that may seem obvious? Perhaps downsizing the three inchers will be enough for now! Or as a collector, do I preserve them as beloved pieces of art? I know that I’m not alone. Do you have silent stalkers that are causing concern? Blue knit dress with scarf and jewelry – gifted, black straw hat – Diane Harty Millinery HERE, black booties – retail sale. 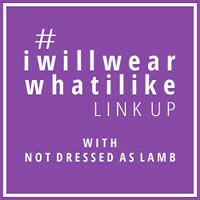 Linking up with Patti’s Visible Monday HERE at Not Dead Yet Style, Catherine’s #iwillwearwhatilike HERE at Not Dressed As Lamb, and Cherie’s Shoe and Tell HERE at Style Nudge. It’s such a bummer about the things about our bodies we have no control over! I keep saying I want to stay in shape so I can wear my heels to my grave—unless other things get in the way! I had a pituitary scare just 6 months ago—but so far it’s been okay. You’re right how things can change in an instant. My husband & I always say that’s the reason to enjoy every day—because really we are so blessed! Judith, you are a glamorous, sophisticated lady! I have just been discussing a somewhat similar issue. I live with chronic pain, sometimes acute and trying to think about what is healthy balance for myself. That is to know when I have to rest, take pain killers and to know when I can do my Pilates, walk, garden (ouch! ), travel ( sometimes ouch), cinema, theatre etc. I can get into an unhelpful mode of pushing myself to beyond my ‘limit’ because I can have an unhelpful and deeply inbeded belief that not to is to ‘give in’ and of course that would be terrible! I too love style and clothes but I also know I can hide behind them ( useful at times) but then become cross because ‘people’ don’t realise how much pain I am in. Does this sound familiar? Part of this is a sense of not being in control, being dependent ( how dreadful!) and I suppose being invisible, all part of ageing in our youth driven society. I would like to think that should my pain become unbearable and I could not successfully apply my red ‘lippy’ then I would be able to take measures to end my life. I say this in a calm reflective way. My husband will not discuss this and my beautiful 25 year old son kindky,lovingly but in a matter of fact manner tells me that he thinks voluntary euthanasia will be legal by then. So much to think about but also so much life and things on my bucket list to fufil. Ah, I know all that you speak of – I am heading to the doctor right now for a follow up appointment. Hi, my husband had a peel for the epiretinal membrane last May and it went really well. The procedure will accelerate any cataract, however. So he had his cataract surgery in February. Recovery once again was very rapid and he’s quite pleased with the improvement in vision. Judith, you are an inspiration in all things. I am sending healing vibes for your lovely eyes and bones. You look beautiful, as always. I was in the emergency a week ago today for severe chest pains. Lucky for me it wasn’t a heart attack, but they still don’t know what caused it and it freaked me out for a few days. I’m scheduled for a surgery towards the end of June, not looking forward to that either. The silent lurkers are a Damocles sword above our heads as we age. Aging isn’t for wimps. That’s for sure. You keep forging ahead. As for your eyes, Japan is stellar in eye-related breakthroughs. Stunning, stunning work. So you never know what’s head on the good side too. We love your bones. I recommend flying though, I mean human flying, not by airliner. Always takes the stress off our bones. Hugs, Judith. I love your best attitude. And stunning photos! No, you are not alone! I understand your situation completely because my very visible disability complicates age-related conditions and vice-versa. It’s difficult to explain to people that my Cerebral Palsy means my capacity for movement is equal to someone 20 years older than my chronological age. Ah yes….as they say, aging is not for sissies. Twenty five years ago my chiropractor said that my daily, aggressive, one mile swims, and my beloved yoga were all well and good, but I needed more pressure for my bones. Therefore, for the past 20 years I’ve become addicted to weight training, with the motivation of a trainer and barefoot Afro-Brazilian dancing. So far, so good. I, too, have the beginning of cataracts…..I suppose all we can do is be mindful, get check-ups and ultimately just know what works for us. And definitely hold on to the shoes! You can wear them for photos and special occasions. I gave up on high heels long ago, but a nice smart pair of shoes with Cuban heels make my heart go pitter patter… in a good way. Thank you for sharing the health issues, it reminds me of the importance of tending to that for myself, the best that I can. I also have an ongoing health condition, a spasm on one side of my neck. I do a lot to live healthy. Thank you for sharing your challenges. The unexpected health challenges seem to be something that come to us all with age. I caught my toe in a pant leg almost 4 years ago. I spun around and fell, the impact on my left elbow travelled up, broke my arm, and popped my shoulder out, I now have a titanium bone, and all the tissue had to be pinned and reattached. I am not the same as I was, but I am very grateful for what I am. I can only think that your hopeful and grateful attitude will serve you well, as mine has me. Complaining just clears the room anyway. and made an issue of it. Sorry to hear of your health challenges. You have met other life challenges with determination and grace, and I expect we will see the same again. Your courage gives us the same. I gave up high heels in my 50’s and I don’t really miss them. They caused pain in my feet. I am fairly healthy, but as I get older, I am less sure-footed. Heels unbalance us badly. Don’t take any chances!! You will met these new challenges with patience and grace, as you have shown us before. If I may make a suggestion- re the osteoporosis, I love yoga as well, but have added T-Tapp to my routine and have seen an improvement in my bone-density. You can google this , or find it on youtube- look for the one with Beri- Teresa’s 88 year old model, and hear about Beri’s improvements. Hello Judith and thank you for this superb post – gosh, yes, I think ageing is hard work. I find I have to maintain my health through regular 3/4 times a week yoga stretches (because I wake up very stiff and slightly crooked) and I do long walks with some exertion (I run uphill). I used to go the gym but haven’t since the winter virus. I was diagnosed with osteoporosis about 3 years ago and so far have avoided the medication (maybe you have it?) a once-weekly bisphosphonate. I might one day have to take it but don’t really like the idea because of the side-effects, especially re: dental work. So I take calcium and Vitamin D. But I agree with some of the commenters it’s also good to weight-bear and bang down those pins onto the floor – that T-Tapp sounds good but haven’t heard of it here in the UK – must look it up! And then there’s the little skin cancers that pop up on my skin and so it goes. But a ‘I don’t give a damn’ and a positive attitude works well, plus an attitude that there’s always something new to learn just around the corner – that’s what I love doing – that feeling of ‘what’s next!’ As for heels – I think that there are many lovely flats – haven’t worn heels for about 15/20 years now. Maybe wear them for shoots and special non-walking occasions! You’ll look fabulous whatever you wear on your feet! You look wonderful in that shade of royal blue and the length shows off your fabulous legs a treat. Getting older is not for the faint hearted. It needs courage and fortitude. I find that despite my fairly constant reminder from my knees and sciatica that my body has lived many active and productive years I have a greater inner peace and more a sense of engaging with life every day. I simply do not have enough time to waste on pointless worry and angst. Our eyes may dim (I also am developing cataracts and within 5 years will need lens replacements) it does not mean that living life fully needs to fade. Ahhh Judith, you look so slender and lovely!! I too have osteoporosis and have chosen to take IV Reclast once a year. I love walking and that is a beneficial exercise, but I have given up Pickleball and I won’t start tennis, two sports my husband loves. I know of several players who have fractured bones falling when lunging for a ball. Yes, aging well is a challenging process, but we are fortunate to have so many choices to live well and enjoy each day to the fullest. Such a relevant post!! I am so sorry to read about the macular degeneration and concern with the osteoporosis onset. It is unfortunate that no matter what we do, age does take some physical toll. It is obvious you are doing all within your power to meet these challenges. Please continue to be an inspiration to us all. By the way, those boots are wonderful!! ..you’re right, they are really retail therapy!! I think it is rare that we don’t have “stalkers” at our age. I have been dealing with hypertension and high cholesterol for a decade. I’m 65 now so this all started in my 50s. Both my parents dealt with the same problems so I think it was just in my genetics. It’s rather a sad truth that the longer we remain above ground, the more health concerns will likely become apparent – there’s no prize for being the last man standing (which seems very unfair!). We can remain vigilant, and optimistic and attempt to do the best self-care we can, but there will always be the things beyond our control as you are experiencing. I have been having problems with my eyes the last few years, and I worry about my declining eyesight; not being able to see the world around me would be a terrible loss to me. I have started going to physiotherapy for my back, which has been giving me pain off and on for years, and had my first acupuncture treatment (which helped), so I am learning that I need to take better care of myself. Judith, your beauty and elegance do not protect you from the ravages of time which are gathering within. Is it better to remain ignorant of these issues or face them head on? I’m a head on kinda gal, and I suspect that you may be too. My eyesight has been affected by sun damage on top of the fact that I have drusen on both optic nerves. Nothing can be done about them, just monitoring. I also suffer from a (currently dormant) bowel disease. Perhaps you weren’t so wise to ask us all to share our ailments with you? We have to forge on, making the best of our lives, which is what you most definitely do. You inspire so many, are loved by so many, including myself. LOL, I haven’t been able to wear heels since I was in retail management & then had kids, 30 years ago! I can’t even wear TWO inch heels. And I’ll be 61 next week. I also have osteopenia (I take HRT for that for now), poor vision/double vision/prisms in my eyeglasses, and have always had poor balance (could never ride a bike), so I do fear falling, which I do about once a year but so far, luckily, have not broken anything. I also haven’t worn serious heels for 30-odd years (I’m 62) . I remember noticing the sudden absence of pain , twisted ankles and knee bandages – so I can’t connect it with aging exactly ! Probably I never should have worn them but I am short….Keeping beautiful shoes as art is a great idea . I used to have a pair my sister made for me – 5 inch narrow heel , black with a silver ankle strap decorated with a black and silver star – on my bookshelves for years . I finally gave them away in the hope someone else could at least stand up in them ! As for my silent stalkers I am superstitious enough not to want to talk about them because it makes them bigger & more scary – but thank you for this post . Sorry to hear about your sight. I know you do yoga which is the best thing for keeping the bone density you have by keeping your muscles strong. All I can say is that I will take mechanical challenges over the mental ones. I have small ones that can be managed thru diet and excersise. Physical movement for me has been the best ” medicine” for everything. Keep wearing your heels until you can’t! I am 60. My mother and her half-sister both developed Alzheimer’s. This fact makes me nervous and anxious when I can’t recall a name or a word…. I am so sorry to read about your silent stalkers, but so happy that you have such a positive attitude about it all. I have early stage cataracts and have been living w/a not-so-silent stalker for almost 20 years now — fibromyalgia. Fibro and I have come to a comfortable little arrangement, he and I. In so far as I can, I ignore his little temper tantrums (flare-ups) and go on w/my life. Would you mind if I add you to my every-growing prayer list? I am a believer, but, if you are not, you’ve got nothing to lose. While I hope your health problems can be resolved in the near future, it’s truly amazing how you approach life with the vigour and energy that people much younger than you could never ever match. I wish the best for your health in the months and years going forward. Look up the literature on prunes in regard to osteoporosis. I so understand tese concerns. I have been diagnosed with a chronic illness……taking vare of myself has become an even more important task. Aging wisely is a priority, now more than ever. I admire you very much, thank you for sharing this post. BTW, you look amazing!! !